Close to the US-528 expressway, Orlando International Airport (MCO) is around 7 miles / 11 km southeast of downtown Orlando and also near to Belle Isle, Lake Nona, Lake Warren and Mud Lake. Orlando Airport is the premier gateway into the very heart of central Florida and with annual passenger levels of more than 35 million, falls just outside of the world's busiest ten airports. MCO Airport itself is well placed to easily reach all of Florida's main cities, beaches and many tourist attractions, and has become known for its considerable efforts to be environmentally friendly. Orlando's airside Terminal 4 is a particularly attractive and sophisticated facility, boasting many glass walls, lake views and an impressive skylight dome which floods the space with natural light. Both Lynx and Greyhound buses operate at Orlando International Airport, being based on the Main Terminal's A-side. Buses link the Orange Avenue, the Old Winter Garden Road and International Drive, where many enormous shopping malls and tall hotels reside. 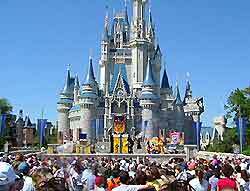 Those with a family and planning Orlando holidays will be pleased to learn that buses and shuttles regularly run to areas of the famous Walt Disney World district, which resembles a medium-sized town and covers almost 50 square miles / 130 square kilometers. Taxis offer one of the best ways to reach the many suburban tree-lined streets within downtown Orlando itself. Orlando International Airport is also home to numerous ATM cash machines, Travelex centers, newspaper vending machines, a branch of the SunTrust Bank, postal services and a beauty spa. Also onsite in the Hyatt Business Center are various airport art displays, which are managed by the Greater Orlando Aviation Authority and include the popular 'Share the Art' program. One of Florida's most famous and visited resort cities, Orlando really does have it all. Home to the Walt Disney World, SeaWorld, MGM Studios, Epcot Center and the Universal Orlando Resort, more than 50 million tourists holiday here every single year, meaning that its supporting airports can become extremely hectic at times. Orlando Airport (MCO) has actually become the busiest airport in the whole of Florida and for many, is a gateway to one of their most memorable holidays ever. Near Kissimmee is far less developed for tourism, but does tend to offer cheap accommodation and a handful of good attractions, such as airboat tours of the Everglades, and Gatorland and its many alligators.